Set deep in the bush on a hillside with stunning views, Kwihala Camp is positioned in one of the prime locations in Ruaha, in an area famed for its rich wildlife sightings and rare sightings of other safari vehicles. Set deep in the bush on a hillside with stunning views, Kwihala Camp is positioned in one of the prime locations in Ruaha, in an area famed for its rich wildlife sightings and rare sightings of other safari vehicles. This simple yet luxurious semi-permanent camp is as close to perfection for a safari enthusiast as possible. Close to the Mwagusi Sand River and Mbagi, Kwihala (which means ‘bush’) Camp is situated far from any other camps in Ruaha, in an idyllic, remote part of Tanzania; guests will see little human activity. Kwihala Camp has gained a reputation for its high standard of guiding and the excellent guides will take guests further into the wild than they have ever been before. The main activity at Kwihala Camp is the daily game drives; exploring with some of the best guides and in some of the most remarkable wilderness in East Africa. The fully qualified and licenced safari guides at Kwihala Camp are at the top of their profession and share a strong passion for wildlife. This is undoubtedly a thrilling experience in an area renowned for its high concentration of predators and big game. Track prides of lion, packs of hyena, cheetah, elephant, buffalo, kudu, antelope and sable. Enjoy a ‘bonnet breakfast’ on an early morning drive, where breakfast is prepared on the bonnet of the safari vehicle and is served in the heart of the bush. Walking safaris, under the guidance of specialist walking guides, allow guests to experience the bush in a very intimate way and get to closer to the wild than they have ever been before. With over 500 bird species, birding is an exciting activity with a guide. Night safaris offer the best chance to see Tanzania’s nightlife with many predators taking advantage of the dark to stalk their prey. For the more adventurous traveller there’s also the opportunity to go fly-camping. At Kwihala Camp there is plenty of scope for all guests to explore what really interests them; be it birds, bush or animals. 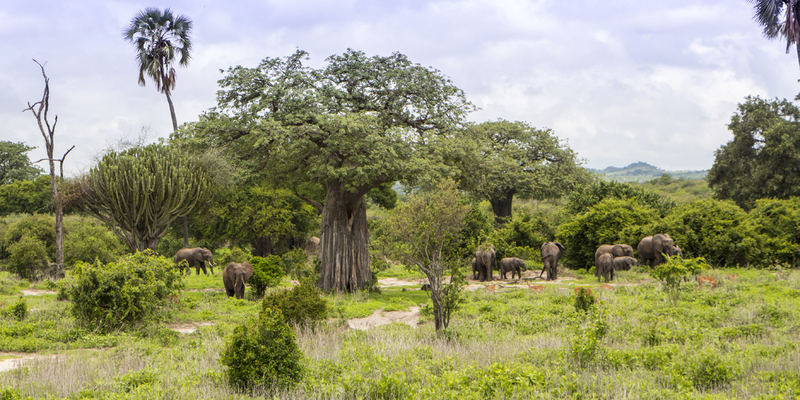 Ruaha contains a tenth of the world lion population, has the largest elephant population in Africa, and is home to the third biggest population of wild dog in Africa. Guests can also be as awestruck by the mighty baobab forest, towering granite kopjes and shady woodland valleys as by the animals. Kwihala Camp allows guests to experience the vitality and exhilaration of a tented camp without sacrificing any of life’s little comforts. Guest accommodation is within six spacious tents set amongst light combretum woodland on a hillside; all enjoy incredible views of their surroundings as well as benefit from a cooling breeze during the heat of the day. The natural-coloured tents are designed to blend into the bush so as to cause as little disturbance as possible to the natural fauna and flora. They are spaced out to enable the guests to really enjoy the park and the intimacy is part of the appeal. Elegantly furnished in an understated manner, with double or twin beds, there is no shortage of little luxuries. All have en-suite bathrooms with safari bucket shower and solar-powered electricity for lights and recharging camera batteries. Kwihala Camp is defined by simple excellence and exposure to nature. It is not uncommon to see game pass through camp while relaxing on the veranda. Witness lions hunting their prey, and herds of giraffes and elephants passing by the front door of the tent. The mess tent lounge and dining area is the social heart of the camp. This wonderful open-sided communal tent faces out to the bush and outside the main tent, under a shaded roof; the small veranda offers stunning views of the escarpment. The campfire and outside dining table are often the places where guests find themselves engaged in stimulating conversations about the day’s sightings over a sundowner or two. Public areas are predominantly lit by the campfire and lanterns, creating an incredibly authentic and romantic atmosphere. With a wonderful camp location, serious guiding, attentive staff and a high standard of food - Kwihala Camp suits adventurous travellers looking for a bit of luxury. Camp is closed and dismantled mid-March and re-established in June. It is moved seasonally leaving very little evidence that they were ever there and also the game do not permanently associate the site with human infrastructure.